We’d love your help. Let us know what’s wrong with this preview of Crash! Boom! A Math Tale by Robie H. Harris. How do these blocks stack up? Gentle math concepts go down easy in this fun and accessible story for very young children by the esteemed Robie H. Harris. Elephant has a bucket of blocks and wants to build something tall. Something as tall as Elephant. But will it stay up? CRASH! BOOM! Not this time. Build it again? One block. Two blocks? Four blocks? It's still not as tall How do these blocks stack up? Gentle math concepts go down easy in this fun and accessible story for very young children by the esteemed Robie H. Harris. To ask other readers questions about Crash! Boom! A Math Tale, please sign up. This is a very simple book that shows an elephant child building a tower. As he builds, he learns that stacking the blocks in different ways can result in towers that are stronger. I like the concept but feel that it was too simple for most kids that are interested in building. I'm not sure what the author's intention is: to teach kids how to successfully build with blocks, to count? The use of photographs and illustrations together works nicely, and the cheerful, blue elephant is delightful but I suspect kids will have trouble transferring the information to the block corner. Hello, friends! Our book today is Crash! Boom! 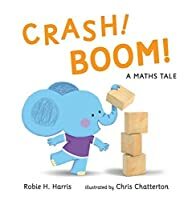 : A Math Tale, written by Robie H. Harris and illustrated by Chris Chatterton, a sweet story of a young elephant learning to build a block tower. A little elephant plays with a set of blocks, stacking them to form a tower. He hopes to make the tower as tall as he is, and after some careful balancing of four blocks on their ends, he does – until the unstable tower collapses with a “Crash! Boom!”. The little elephant cries a few tears, but then starts again, finding that the blocks are more stable on their wider side, but it will take twice as many to achieve the same height. Once again, the elephant builds the tower to his liking, this time enjoying an intentional “crash! boom!” when he’s done. But what other combinations of blocks can make the same height? Time to experiment and see! Adorable. Even without the math elements, the precious elephant and his exuberant block-building are a charming story about trying again when your initial attempt fails. 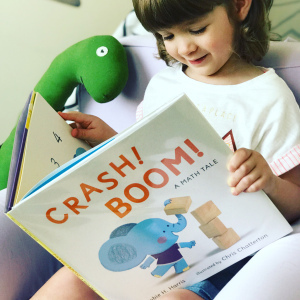 The elephant’s expressive face and body, interacting with real-life photos of wooden blocks and containers, was absolutely darling and won JJ over from the first page. The added bonus is the subtle inclusion of basic math principles like counting and geometry, kept simple enough that beginners can follow along and build a foundation for future math concepts. The length was great, and JJ loved it. A delightful little story that encourages experimentation, perseverance, and play, and we loved it. Baby Bookworm approved! Since this book was labeled as "A Math Tale", I was expecting a little more. There really isn't much math involved. Yes, the elephant counts up to 8 and shows that the tower is the same height as he is, but that's about it. The narration didn't even focus on the subtraction of blocks when the tower fell. There are things parents can point out to their kids, but I think that is true with almost every book. The illustrations were interesting. They feature real-life block pictures with a little cartoon elephant added in. They were cute, although the contrast kind of threw me at first. So much potential! A story about a little elephant building with blocks, seeking to make a tower as tall as they are, so they can knock it down? What child wouldn't love that? It is just the ending that feels unfinished. The tower is built, knocked down, built again, and knocked down, then built again, and the elephant falls asleep?? Really? I do really like the illustrations. The basic background sets off the blue elephant, and the blocks look like photos. A child could look at just the photos So much potential! A story about a little elephant building with blocks, seeking to make a tower as tall as they are, so they can knock it down? What child wouldn't love that? It is just the ending that feels unfinished. The tower is built, knocked down, built again, and knocked down, then built again, and the elephant falls asleep?? Really? Crash! Boom!... a wonderful short story for young readers first starting on their counting journey. The adorable blue elephant attempts to stack jenga-like wooden blocks to add a couple at a time to equal his or her height. The cheerful elephant struggles, attempts different methods, and triumphs while counting, learning geometry, organization, and fun! Fun words and a happy ending that reminds children to pick themselves up if they fall and try, try again. A math book for toddlers? Yes, please! The adorable elephant character counts his blocks as he stacks them up! Every toddler can relate when he works so hard to stack and then accidentally knocks them over...but next time he has fun knocking them down! Up and down is half the fun! He experiments with stacking them different ways too which shows toddlers about trying different things...great all around, while simple enough for the littlest readers. Really cute story about an elephant building a tower (but also secretly about math!). It's so charming - you can practically see the wheels turning in Elephant's head as they try to figure out how to get it juuuust right. I loved this little book for preschoolers. As did my 1 1/2 and 3 1/2 year old grandsons. It’s fun and educational at the same time. The illistrations are charming and I would certainly recommend it highly! Math concepts are as elusive as the storyline in this odd tale about an Elephant obsessed with its own height. The lovely photographs of the beautiful wooden blocks steal the show; perhaps the blocks could have told their own story without the elephantine protagonist? The illustrations MAKE this book! I love the photographed blocks!!! It's a super-simple story, but it does teach basic counting, comparison words, and that sometimes you have to keep trying if you want to reach a goal. Highly recommended. great counting book for young toddlers. Would be great for a building block storytime for toddlers...pair with Irene Dickson's Blocks. Great STEM book for pre-schoolers showing how to problem solve when building a tower. I really like Robie Harris, but I found this one just kind of so-so. Nice math book useful for demonstrating non-standard measuring units with a cartoonish elephant amid a backdrop of photos of real wooden blocks. STEM engineering for the preschool crowd. Taller/shorter/more. Hands-on experimentation. Fun! We4ll done! Clear concept book - combination of photos of real blocks and simple elephant character show size comparisons for the youngest of readers. A fun picture book about building and counting for the youngest of kids. Stacking blocks, mishaps, solutions found. Cute, subtly math-oriented, block building story. A fun book with some basic math elements. An up and down tale about building blocks and counting. Robie H. Harris has written many award-winning books for children of all ages, including the definitive Family Library about sexuality: IT'S PERFECTLY NORMAL, IT'S SO AMAZING!, and IT'S NOT THE STORK! She lives in Massachusetts.